When you though it wouldn’t be possible to land… a helicopter proved you wrong. This saying summarizes the capabilities of a helicopter, and the potential that it has to offer. Whenever there is a need to fly somewhere, and there is no airport around, there is only one solution… a helicopter. The ability to fly with a minimum airspeed of your preference, the helicopter has a great advantage over an airplane when considering the weather conditions and minimums for a VFR flight. These characteristics enable helicopters to be frequently used by rescue operators and business owners. Because of the constant increase in demand for direct-to flights for business meetings, or potential investment sights, the growth of helicopter operations has been exponential. Naturally, one of the positive effects is the increase in demand for helicopter pilots. We offer a variety of flight courses that will best suit your needs, this involves flight training for the: private pilot’s license, commercial pilot’s license, type rating (Mi-2, R-44, EC-120), verification of licenses acquired through the military, and even renewal of lost licenses and/or ratings. The minimal amount of hours of flight training that one must complete is very similar to the requirements for the airplane licenses (45 hours for PPL, 185 hours for CPL). The two biggest negative aspects of helicopters are high costs for their initial purchase, and high operational costs. Consequently, the flight training itself is about 4-5 times more expensive than flight training done on airplanes. However, if you choose to invest in your aviation career, you will have a pleasant surprise waiting for you. As an executive charter helicopter pilot you will be making at least the same amount of money as airline pilots. 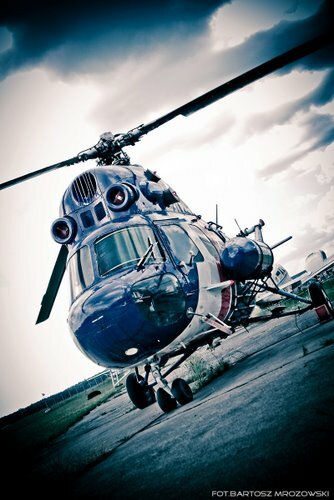 If you are not comfortable in the business world, and you wish to use your aviation skills in order to save human lives, you can reach this goal by getting hired in the Polish Helicopter Emergency Medical Service (HEMS or in Polish LPR), which is currently upgrading their fleet to the most modern helicopters in the world. A commercial helicopter pilot license is a great opportunity for an interesting and eventful life.